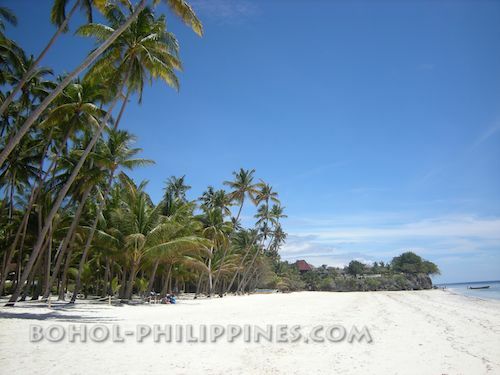 Bohol Philippines is fast becoming one of the top travel destinations in Asia. 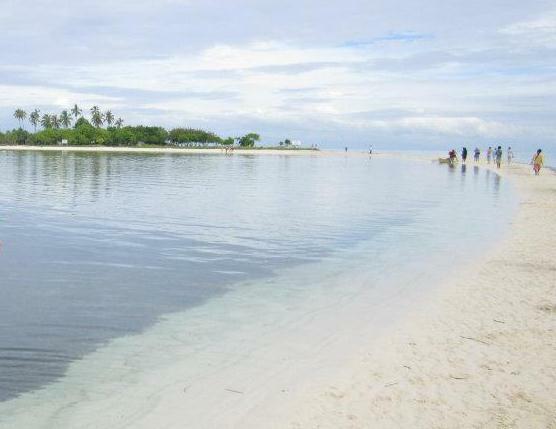 The island offers a wide range of attractions from natural fine white sand beaches, great diving sites, scenic natural sights, old houses, ancient churches, historical sites and wonderful ecotourism highlights. The rolling chocolate hills, crystal springs, mangroves, mahogany forests and white sand beaches makes the island one of the most picturesque provinces in the Philippines. Bohol sunsets are ephemeral. Our website is an introduction to Bohol and the best attractions the island can offer. We have everything you need to plan out your trip, get there safely, select the best tours, enjoy your trip and collect memorable moments. Enjoy some of the best photos to wet your appetites. 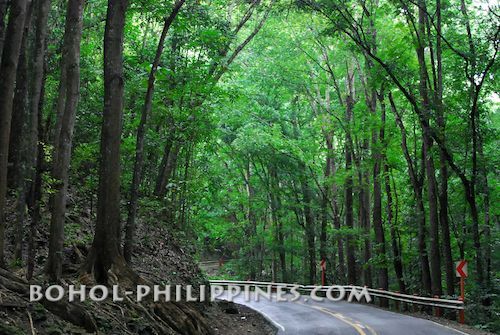 Bohol's ecology and natural heritage are few of the wonders to see. Only Bohol has a 134-hectare sanctuary for the small tarsiers. Prony is the biggest python in captivity ever known. Birding, dolphin and whale watching and of course diving are popular activities. Many are lured to the white sand Bohol beaches, the cool crystal blue waters, and the world-famous surrounding dive sites. The visitors stay, some for good, because of the tranquil ambiance. Listing the best of Bohol attractions - chocolate hills, white sand beaches, scuba diving sites, dolphin/whale watching, tarsiers, mahogany forest, rivers cruising, Spanish churches, old houses, etc. Bohol Mangroves are critical spawning, nursery, feeding and transient shelter areas to hundreds of fish species, crustaceans and invertebrates and support an abundant and productive marine life. Bohol island is also replete with heritage sites, ancestral homes and some of the best preserved churches of the Philippines. 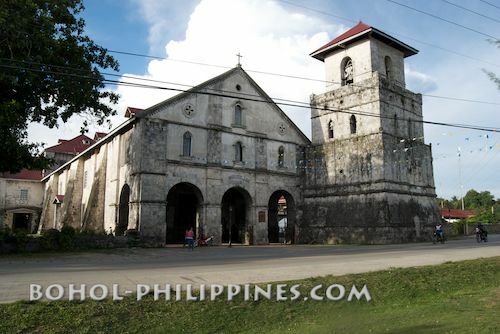 Most of the 47 towns of Bohol have old massive stone churches with frescoes all done during Spanish colonization. Markers and memorials to past revolutions and wars, museums, caves of patriots are there to see. Plan your Bohol Trip Here! This is our Bohol Philippines Travel Guide! Tour the island and see the gushing springs, waterfalls, rivers, sandy white beaches, natural coral havens, exotic marine life, caves, mountains and forests rich with wildlife and rare flora. Bohol festivals and feast days are part and parcel of Boholano culture. Boholanos are fun-loving, generous to a fault, and deeply religious. A comprehensive list of Bohol hotels and beach resorts in Panglao Island, Anda, Tagbilaran, Cabilao, Balisacag, Calape, Guindulman, Jagna, Loboc, Talibon, Tubigon, Valencia, and other areas. Lluxury and stay in some of the best luxury hotels in Bohol Philippines; ideal accommodation in Bohol for business and leisure travelers. 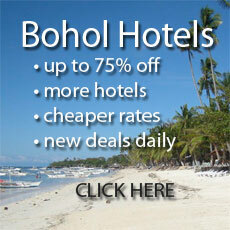 Check out our listing of the cheapest hotels in Bohol. Select the most affordable accommodations according to your budget. Just click on the check rates button to find out the lowest prices. 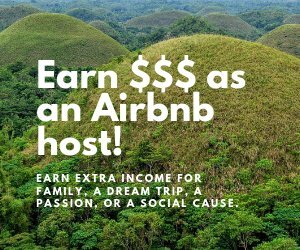 Bohol Accommodations, Hotels and Resorts, Inns, Pension Houses, Villas at various places: Panglao, Dauis, Tagbilaran, Anda, Talibon, Tubigon, Backayon, etc. Visitors tell their Bohol stories - straight from the heart. How do you like these Bohol attractions? Do you have a great Bohol story? Share it! Bohol tarsiers measures 4 to 5 inches and is considered as the worlds smallest primate. Its size is no longer than an adult mans hand and weigh only about 113 to 142 grams or four to five ounces. World famous Chocolate Hills of Bohol are natural 1,268 cone-shaped hills whose strange geological formation has baffled geologists but entertains both locals and tourists alike. Bohol Ancestral Houses dating back to the 20th century of the Spanish Regime, said to be the 'golden age' of Bohol, these old houses were huge and largely made up of coral stone and hardwood. Limestone foundation created to date more or less 1,400 Bohol caves throughout the island which got its name from the word “buho”, meaning “hole” from which spring water usually gush forth. Bohol Restaurants offers various dining and cuisine options - are located either in hotels, resorts, or around the Tagbilaran city and other towns offering local or international cuisine. Seafood!! Bohol is further known for its festive fiestas and merry-making. And one thing to boast upon is the native mouth-watering delights that are already been recognized as signature Boholano Delicacies. Major Bohol shopping in Tagbilaran. Souvenirs and Handicrafts shopping. Find Bohol crafts and decors, Tarsier dolls, shells, pearls, and purses. Buy baskets, jewellery and wooden furniture. Calamay? Bohol is known for its own native products, products made from the indigenous materials found in the province and processed and made by the own hands and sweat of the native people of Bohol. Sagbayan is one of the interior towns of the province of Bohol. It is also among the three towns where the famed Chocolate Hills can mostly be found. It is famous for its Sagbayan Peak. Cabilao Island is one of Bohol's attractive islands with its crystal clear waters, white sandy beaches and exciting dive spots. It lies in the western part of Bohol in the middle of Cebu Strait. Bohol is an island greatly blessed. It is replete with both natural and man-made wonders and offers so many worthwhile activities that would easily fill up any traveler’s itinerary. Getting in and out of Bohol is quite easy: Tagbilaran Airport have Manila and Cebu flights; Several ferries via Tagbilaran, Tubigon, Talibon, Jagna, Ubay, Loon and Getafe connect to nearby islands. Check out and watch our favourite Bohol Videos in this page. If you've discovered a really good video in youtube or other video sites, go ahead and upload them here. Share your Bohol videos! 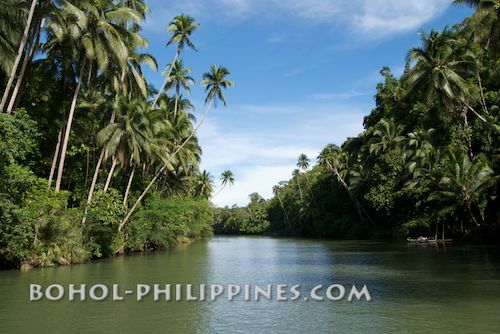 Many of the bohol photos in this website were taken by me. However many more are courtesy of all my friends in flickr who kindly shared their great photography for all to see and enjoy. Bohol maps of the island province of the Philippines located in the Central Visayas region. To the west is Cebu, to the northeast Leyte island and to the south across the Bohol Sea is Mindanao. Compare Best of Bohol HotelsHere you can compare the prices, rooms and facilities offered by various online booking agents. Compare and book the best deals!